The Outrigger and Kon Tiki were modifications of a Gherkin that added 4 keys to the bottom. 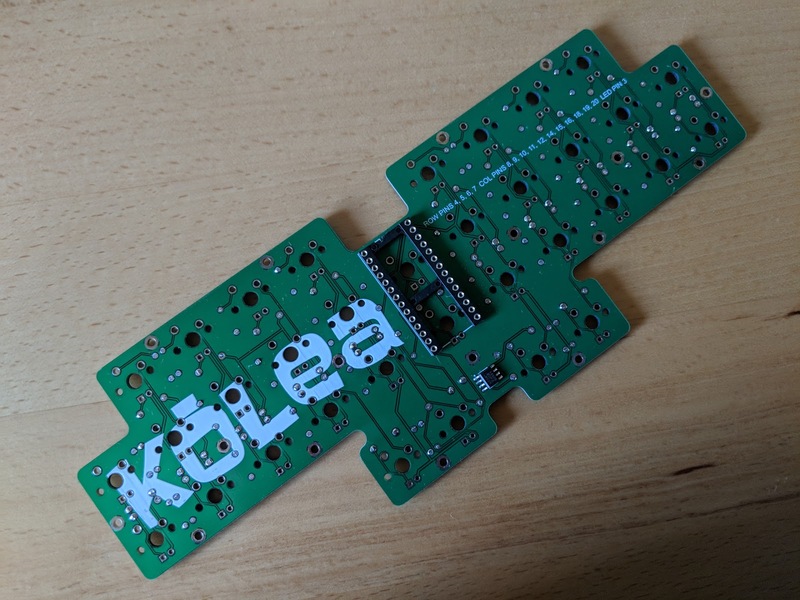 The Kolea is a complete redesign that adds some keys and removes others that aren't used. The firmware is StenoFW by Emanuele Caruso. The only modifications are to the matrix. His original Stenoboard is a split design. The Stenokey project has added additional features to StenoFW. The firmware is an Arduino Sketch, it also requires the PJRC Teensyduino libraries. You should check the PJRC site to see what is the latest version of Arduino that the current Teensyduino supports before installing the Arduino IDE. 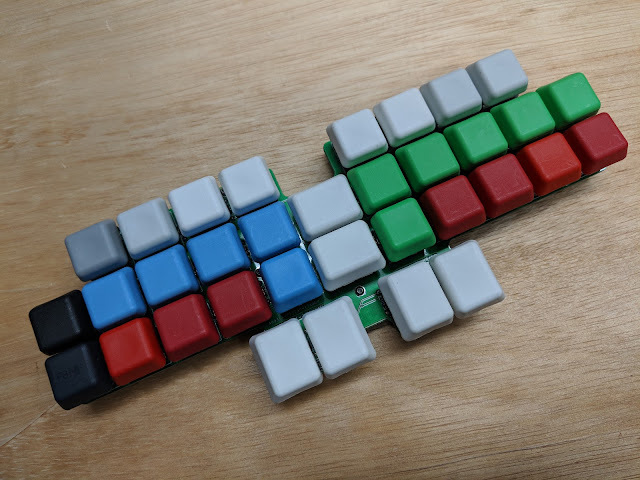 The Kolea has 1.25u width keycaps for the * keys (middle of the board). 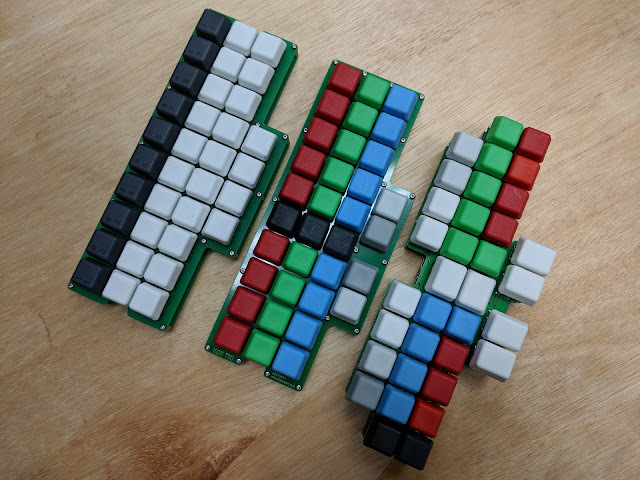 You can also fit 1.25u or 1.5u keycaps rotated for the AOEU keys. Like the Gherkin, a second PCB is used as the bottom. M2 spacers and screws hold the two PCBs together. 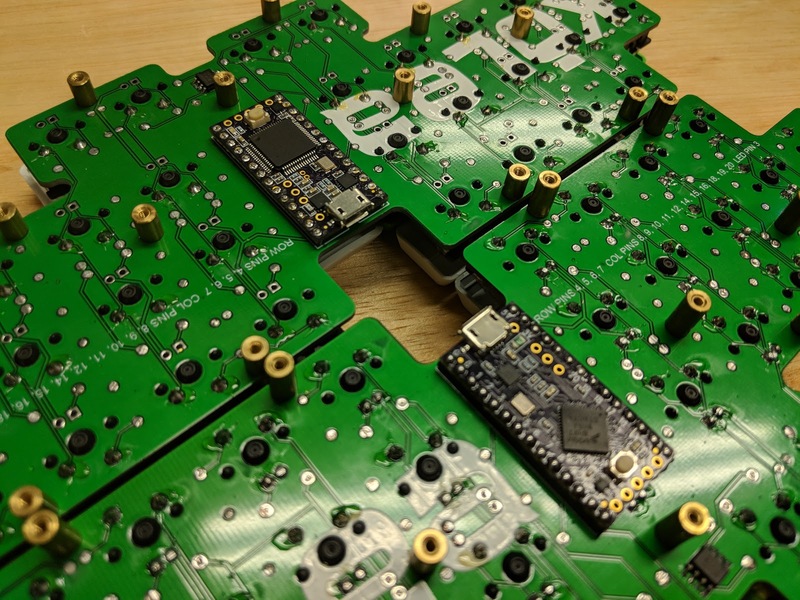 The PCB Gerber files are on Github. The top of the board populated with diodes and resistors. The resistors are optional, only needed if you want LED backlighting. The bottom of the board with the 28pin socket for the Teensy LC (or Teensy 3.2). The SOIC MOSFET is only needed if you want LEDs. This was a 32 pin socket cut down to size. The matrix rows and columns. FN1 and FN2 are for changing output modes. NKRO, Gemini and TXBOLT are supported in the firmware. If you have LEDs installed you can control the brightness with them. It will work with either a Teensy LC or a Teensy 3.2. These are purple Teensy from OSH Park. (Teensy 3.2 on the top, Teensy LC on the bottom). There is no reason to use the more expensive Teensy 3.2, unless you are going to modify the firmware and need the larger amount of RAM and Flash memory. 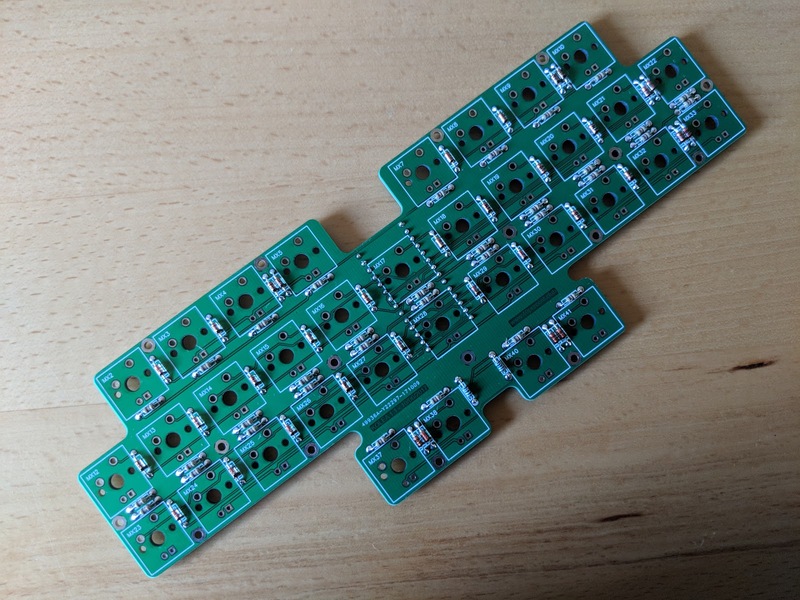 When assembled with a second PCB on the bottom, the reset button on the Teensy is lined up so that it can be accessed through one of the switch holes. The NKRO Keymap. 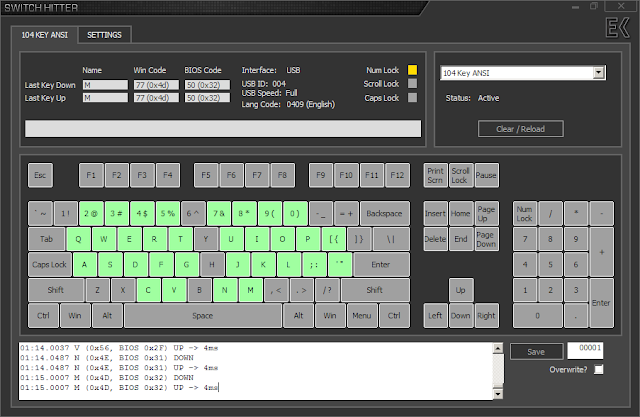 In NKRO mode all the keys can be pressed and registered simultaneously. The Plover stroke display showing all the different individual keypresses in Gemini or TXBOLT mode. The last line shows all keys being pressed simultaneously. In Gemini and TXBOLT modes the output is through a virtual serial port over the USB connection. This is much more convenient as you can continue to use a regular keyboard at the same time as the Kolea. Outrigger, Kon Tiki and the Kolea. I was using the Outrigger and Kon Tiki with Plover as NKRO keyboard devices. It was awkward. The serial output modes of StenoFW are a major improvement.